YANGON—Myanmar is home to several major ethnic groups and over 100 ethnicities in all, each with their own distinct culture and unique cuisine. 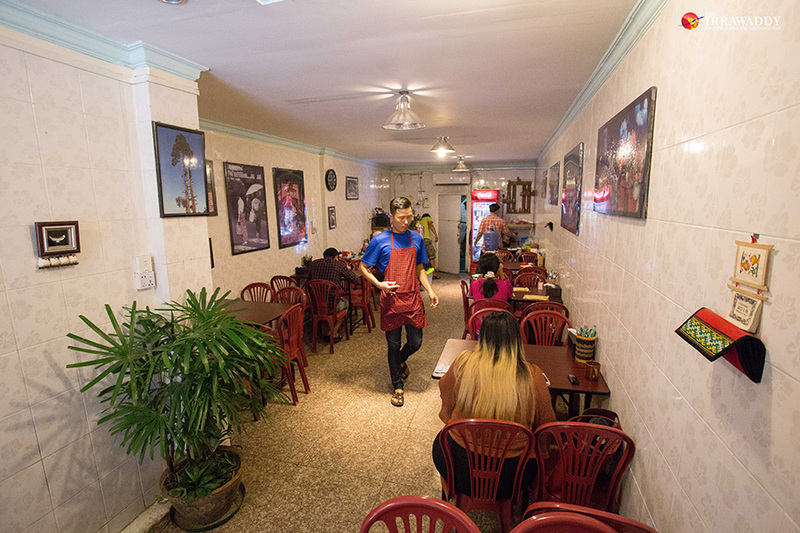 Among the many authentic ethnic eateries to be found in Yangon, the country’s largest city, is the Kachin restaurant Mu Ai. The restaurant is located in a hidden-away spot on a small side street off Hledan Road, but it’s easy to find. All you need to do is walk almost to the end of the road and you can’t miss Mu Ai. The restaurant’s name means “delicious” in the Kachin language. Yes, the food is amazing—really delicious and so creative. The special thing about this restaurant is that they serve authentic Kachin food in fine-dining style. The restaurant was surprisingly small, with only six tables, but it’s clean, and the atmosphere has a pleasant vibe. The décor is very simple, limited to some traditional bags and a few photos of Kachin people hanging the wall. The menu is wide ranging, with plenty of dishes to choose from. Various courses are served including appetizers, mains, soups, noodles and rice sets—all at very reasonable prices. Prior to visiting Mu Ai I only knew a few Kachin dishes, like Kyat Kachin Chet (Kachin chicken curry), Kachin Pounded Goat Meat and Beef Noodles. So, I asked the chef to prepare a few dishes that I hadn’t tried before. He chose a few dishes from each section and cooked them immediately. They were freshly cooked to order—I had to wait a while, but it was worth it. 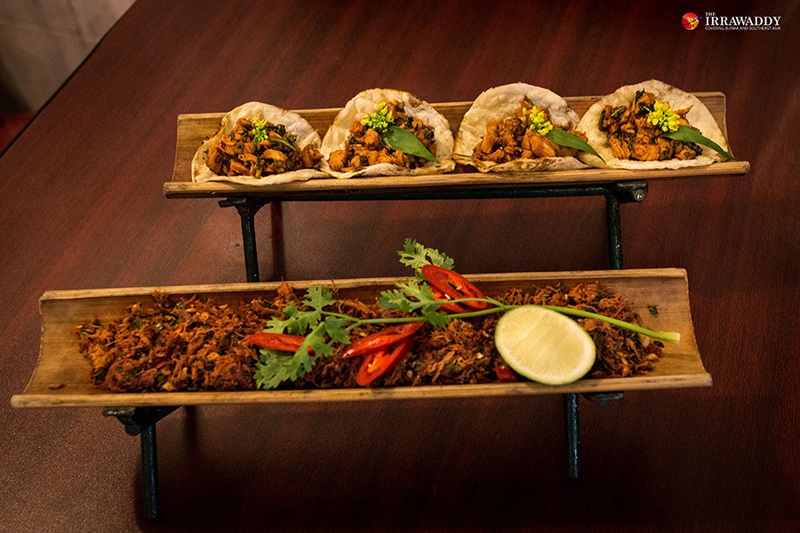 From the appetizer menu, the Kachin Chicken Taco (4,000 kyats) is a fusion dish mixing Kachin and Mexican styles served in a bamboo tube. It contained small pieces of chicken cooked in curry with phet phel, a traditional Kachin herb made from a leaf, as well as ginger and ground coriander, on a homemade taco shell. Many of the ingredients use in Mu Ai’s kitchen, including phet phel, sesame oil, chili and other Kachin herbs are sourced in Kachin State. The dish included four tacos. The taste was a bit sweet but the flavor was really great. The homemade taco shell was soft, not crispy, and it made for a beautiful appetizer. The plate was garnished with cucumber and carrots and topped with half a boiled egg. It came with its own sauce, and served on a banana leaf. The presentation of the dish was really pretty and it had my mouth watering. The brown beef slices were so fresh; the meat, while not super tender, wasn’t overdone. It was cooked medium—a bit chewy but perfect with the vegetable rice. Kachin Yoe Yar Say Kyat Poun (Kachin traditional herb chicken stew, 7,500 kyats) is one of Mu Ai’s main dishes. It features stewed chicken breast with Kachin herbs, ginseng liquor (made from pieces of ginseng root soaked in alcohol) and ginger. The dish, while not a soup, has soup-like qualities. 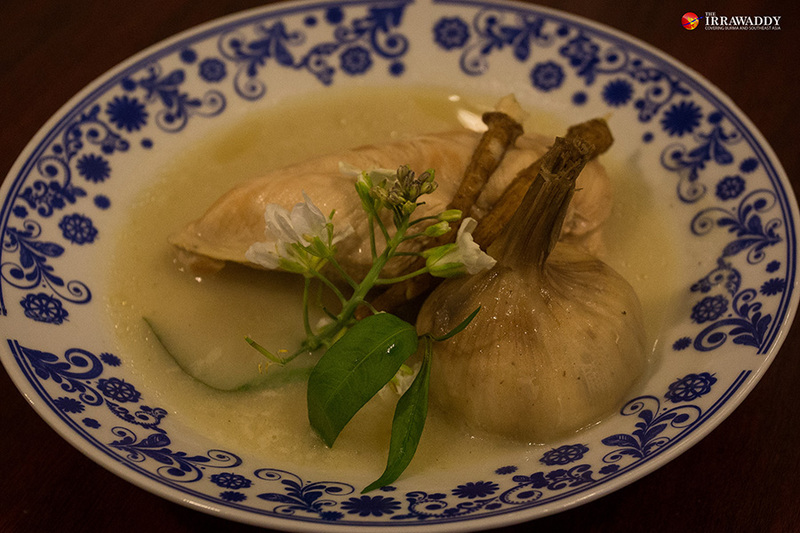 The chicken breast floats in a white broth containing ginseng liquor, topped with ginseng root. Even though it is a stew, the chicken meat is not over-cooked. When you cut the chicken, you can see the tenderness of the flesh. The soup was sweet, combining ginseng and ginger flavors. Another main dish, Kachin Style Pork Belly Stew (7,500 kyats), was just as awesome and another triumph for the chef. That one was also served in a gravy-style curry, including two big cuts of pork belly. The juicy fat layer did not include too much fat and the meat was tender. The dish seemed at first glance to be too fatty, but it wasn’t—the oil in the gravy curry in fact came from the pork. 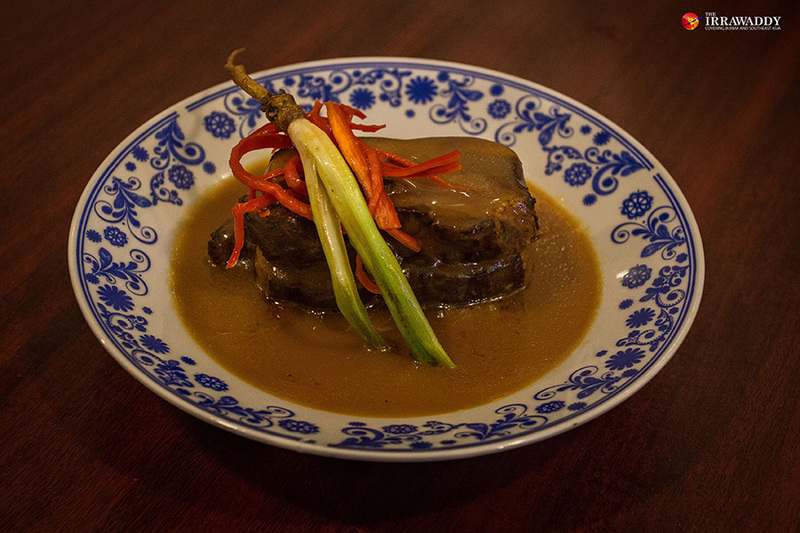 The last item was one of Mu Ai’s signature dishes—the Pounded Goat Meat (4,000 kyats). This one was also served in a bamboo tube. Dried goat meat pieces are boiled and then pounded with lime, chili, Kachin herb and garlic. The strips of meat are really small and melt in the mouth; the ingredients are wonderfully fresh. All the dishes are very creative and tasty; the chef uses very fresh ingredients and removes the fat from the meat before cooking; this is why the meat isn’t that juicy. They don’t use a lot of oil; some dishes have none at all. Padang Laroi, 33, is the tall, apron-clad chef and co-founder of Mu Ai. He creates the restaurant’s menu and designs the presentation of the food. “We opened Mu Ai two years ago, but in a different location, in North Okkala. Many of our customers asked us to move closer to the downtown area,” Ko Padang Laroi said. Ko Padang Laroi is from Bhamo, a town in Kachin State. He has nine siblings, but he was the one who joined his mother in the kitchen to cook meals for the family. He has been passionate about cooking since childhood. “My mom is a really good cook and always knows which herbs or ingredients are good for us. I learned everything from her, though I wasn’t planning to become a chef at that time,” he said. After his matriculation exam, he traveled to Yangon to attend university. He graduated with a business degree after receiving a scholarship from the Graceworks Myanmar organization of the Australian Council for International Development. “I chose food as my main subject and learned everything about food for several years, and received job training at some famous local hotels,” he said. 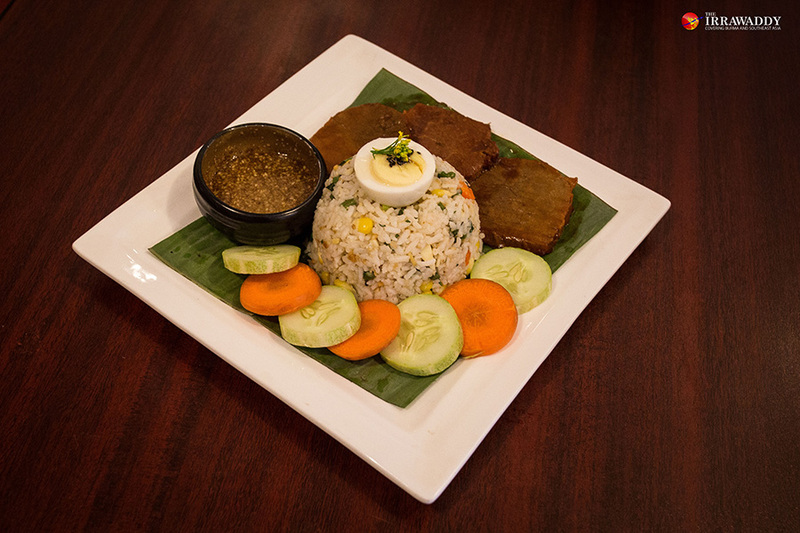 Then, he decided to open a restaurant that presented Kachin cuisine in a fine-dining context. He has put many of the lessons he learned in his scholarship program to use at the new restaurant. “The food presentation is fine dining, but the flavors are still Kachin flavors. Some dishes are fusion and some limit the use of local herbs, because most people would find them too strong. So, I have tried to present flavors that are agreeable to a broader audience,” the chef explained. Most of Mu Ai’s regular customers are foreigners living near the shop who have become lunchtime regulars. “Some are from Italy, some are Japanese and we have some other European customers. We also have local customers as well,” Ko Padang Laroi said. 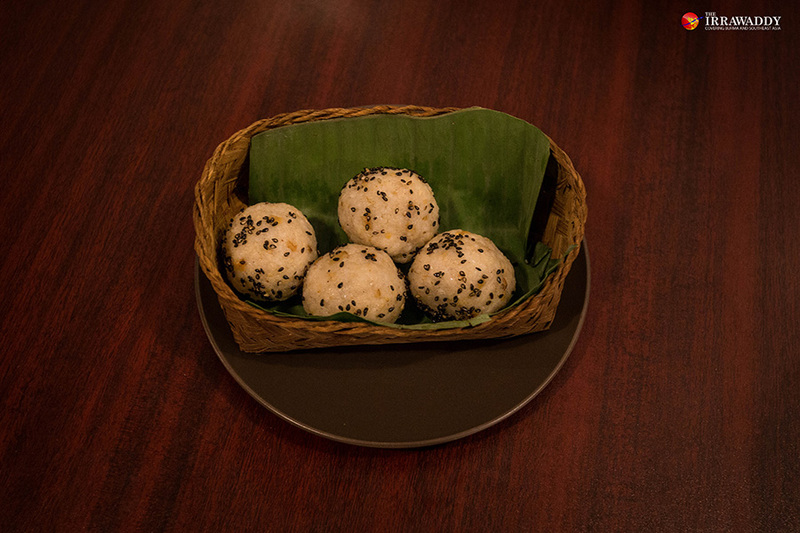 Overall, the food was amazing, and the presentation was really outstanding, living up to the chef’s description of traditional Kachin food served in fine-dining style. The prices are really reasonable considering the quality of the food. So, you don’t need to travel far from Yangon to taste authentic Kachin cuisine: Just take a ride to Hledan 1st Street.